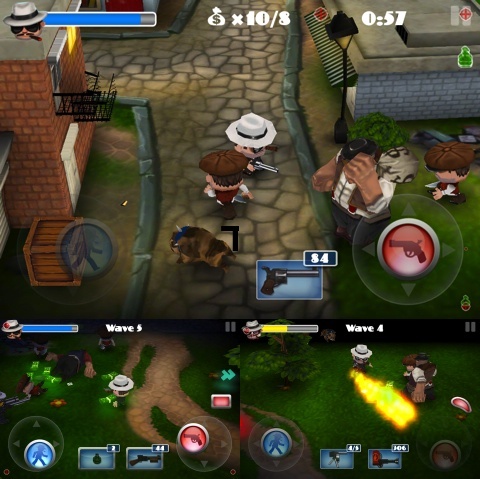 Mafia Rush is an action shooter iOS game from From developer Chillingo. It’s a dual-stick shooter that bills itself as “the gangster game you have been waiting for.” There’s something about the mafia lifestyle that has been romanticized in movies, and I was excited to see how this app would bring that magic to iOS. So, with much excitement, I went to the iPhone App Store and installed Mafia Rush on my iPhone 4S for this review. If you’ve never heard of Mafia Rush, it’s a simple premise. You’re playing as an unnamed mobster who looks like he was pulled out of a 1950s novel. There is a map with different territories that you try to control by choosing different scenarios from the levels. You can choose robbery, defend, attack and survival modes for each territory. The game thrusts you into the action, and your goal is to shoot the enemies and complete the mission based on what mode you chose. For example, if you choose robbery, you’ll be going into a building and collecting money bags to put in your vehicle while fending off bad guys. The simplicity of the title isn’t just in its premise, either. The controls in Mafia Rush are also very basic, as is the progression through the course of the application. You use an on-screen joystick on the bottom left of the screen to control movement, and one on the bottom right to fire your gun in a certain direction. While movement is easy enough, the joystick that controls gunfire doesn’t seem to be as finely tuned. As such, it can be very hard to run and shoot at the same time. After successfully completing missions, you’ll have the opportunity to level up your character’s attributes, including weapons, health and speed. That’s about as much as Mafia Rush has to offer, which is unfortunate. There’s no story other than “take over this territory.” The handful of lines that your character espouses during the course of the action quickly grow repetitive. Even the fun, swinging music that plays in the background grows tiresome after just a few minutes. It makes for an overall shallow experience with very little atmosphere. Mafia Rush was entertaining for the first few minutes while playing it for this review, but the experience quickly became dull. The game has some addictive quality although it’s nothing like original smash hits such as Minigore and . Mafia Rush definitely is not going to pull you in with storytelling, nor is it redefining the mobster gaming genre. No matter what iOS device you have – iPad, iPod Touch or an iPhone 4 – there are better choices for on the App Store. AppSafari review of Mafia Rush was written by Joe Seifi on March 23rd, 2012 and categorized under Action, App Store, Arcade, First Person Shooter, Games. Page viewed 5112 times, 2 so far today. Need help on using these apps? Please read the Help Page. very well made, Thank you very much for the information.